In the first three parts of my ongoing venture to make a Mac mini a powerful component of my AV empire we’ve covered upgrading the Mac, connecting it to a typical AV system, and configuring it to access local and streaming media. We now turn to one of the most important elements of any AV system—controlling it all from the couch. A Mac mini does a far better impression of an integrated AV device when it’s not tethered to a keyboard and mouse. Therefore, remote control is required. In the past I might have used Apple’s remote control or configured my $250 Logitech Harmony 880 Advanced Universal Remote to mimic the Apple remote’s functions, but some of today’s media applications require keyboard input and a measure of mousing. While a Bluetooth keyboard and mouse would certainly get the job done, such input devices are on the bulky side. And Apple’s remote—cute as a button though it may be—can’t handle keyboard and mouse-like chores. Fortunately a variety of inexpensive iPhone and iPod touch applications (and the accompanying Mac-based server apps required by some of them) do. To make the video experience more seamless, launch iTunes on your Mac, open its preferences (iTunes -> Preferences), click the Playback tab, and from the Play Movies and TV Shows pop-up menu, choose Full Screen. (Do the same for the Play Music Videos pop-up menu.) When you do this and then use the Remote app to play a movie, TV show, or music video, that video will automatically play in full screen rather than within the iTunes window. The Remote app is fine for controlling iTunes, but it does nothing for the rest of the Mac. For general-purpose input and mousing I purchased R.P.A Tech’s $6 Air Mouse Pro ( ). Install Air Mouse Pro on your iPhone or iPod touch, and install the free Air Mouse Server on your Mac and you’ve got a remote control that’s capable of mousing, clicking, typing, and scrolling, as well as offering broad controls for Safari and iTunes. Mighty Mouse: Air Mouse lets you control every bit of the Mac’s interface from your iPhone or iPod touch. Air Mouse Pro is a great remote, but for applications such as Boxee, Front Row, and Plex that rely almost entirely on a Mac keyboard’s arrow and Return keys, it’s imperfect as its keyboard is a little small for large fingers. There are other options. For Boxee, there’s the free Boxee Remote application for iPhone and iPod touch. It offers two ways to control Boxee. The first is a four-way arrow pad with a central OK button and a Back button. The arrow pad corresponds to the Mac keyboard’s four arrow keys, the OK button equals the Mac’s Return key, and the Back button is the Mac’s Escape key. You can also control Boxee with a Gesture control—a large Boxee icon that you drag around the iPhone’s screen to highlight and activate objects in the Boxee interface. Regrettably, the Boxee Remote application won’t launch the Boxee application. Evan Schoenberg’s $1 Rowmote: Remote Control for Mac can both launch and control Boxee and a host of other Mac applications including Front Row, DVD Player, iTunes, iPhoto, Keynote, PowerPoint, QuickTime, Plex, and VLC. 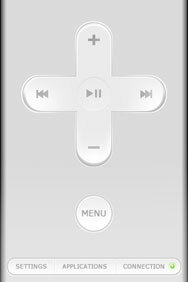 It mimics Apple’s remote with its four direct buttons, central Play/Pause button, and Menu button. Unlike with Apple’s remote, however, you can pick applications to control. Similar to Air Mouse Pro, you need to install a free server application (called Rowmote Helper) on your Mac. 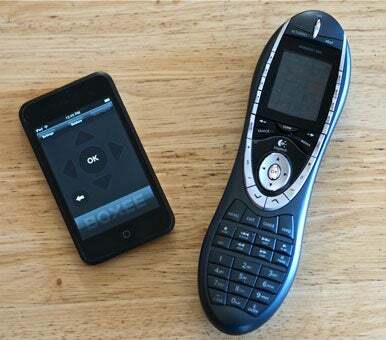 Beyond Apple’s Remote: RowMote provides functionality similar to Apple’s hardware Remote Control, but works with far more applications. And, while not exactly family-friendly, you’re welcome to remotely control the mini from the couch, another part of your home, or across the Internet with a Mac and Leopard’s screen sharing feature, Back to My Mac, or a VNC application such as Patrick Stein’s free JollysFastVNC. These VNC applications allow you to see the mini’s screen on your Mac as well as control the mini’s functions remotely, just as if you were sitting down at that Mac. There are plenty of VNC applications for the iPhone and iPod touch too, including Jugaari’s $25 Jaadu VNC, ReadPixel’s $7 RemoteTap ( ), and MochaSoft’s $6 Mocha VNC ( ). Full of applications though the App Store may be, and capable as the iPhone and iPod touch are, there’s no good universal remote application for the iPhone. (Not surprising, given that the iPhone and iPod touch lack IR, the invisible light that most AV components are controlled by.) Much as I desire a complete Apple solution for controlling everything—Mac mini, TV, and AV receiver—it’s just not in the cards. For that, I returned to the Logitech Harmony 880 Advanced Universal Remote. It’s relatively easy to program and update, handles every bit of gear I own, doesn’t require batteries (it has a rechargeable battery and charging station), and makes sense to my family. If your TV table is littered with remote controls, you owe it to yourself to get a Logitech Harmony remote. Two-Fisted Control: With an iPhone or iPod touch and universal remote control, you’ve got all your Mac and AV bases covered. All the pieces are in place. My Mac mini now plays and rips DVDs, plays and records television programs, plays all the media on my network of Macs, streams videos and audio from across the globe, and flashes my pictures across my HDTV. All without me having to move my keister an inch off the couch. In our final installment, I wrap up with a look at the big picture. As the owner of an Apple TV, DVD player, VCR, and AV receiver with AM and FM tuner, was this all necessary? Did turning the Mac mini into a media center enhance my multimedia life in significant ways? Tune it to find out. Updated to provide correct name and link for Jaadu VNC.